Reading Phillies starter Chuck Malone picked up his fifth-straight win in this May 1988 game. He credited his fielders, including Vince Holyfield, with helping him get it, according to The Reading Eagle. "They played good ball behind me," Malone told The Eagle, "and that helped a lot. Holyfield made a couple of real good plays in left field." Holyfield made those plays in his fourth pro season. He went on to make plays in two more. He never got the chance to make them in the bigs. 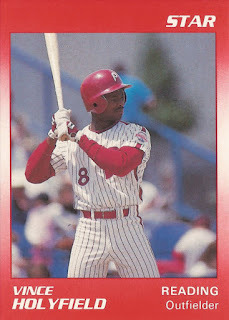 Holyfield's career began in 1985, taken by the Phillies in the third round of the draft out of Southern Arkansas University. With the Phillies, Holyfield started at short-season Bend. In 71 games, he hit .248, with eight home runs. He moved to single-A Spartanburg for 1986, hitting .218 there, with 22 stolen bases. Holyfield returned to Spartanburg for 1987 and had a career-high average of .292 and another career-high in home runs, 18. He also swiped a career-high 56 bases. At the end of the year, Holyfield gained praise from his manager Ramon Aviles, according to The Spartanburg Herald-Journal. "I'm also very happy with the play of Vince Holyfield and Luis Iglesias," Aviles told The Herald-Journal in reviewing the season late that August. "They both had outstanding years for us." Holyfield moved up to AA Reading in 1988. He hit .247 there, with seven home runs. He hit his fifth home run of the year in early August. In 1989, he hit another seven home runs at Reading and stole 21. He had 13 stolen bases by the end of May. He also had a bases-clearing double earlier that month. Holyfield played a third season at Reading in 1990. It ended up being his final season as a pro. He hit just .201, with nine home runs. Two of those home runs came on the same night in April. He got into 97 games, ending his career.